Why does everyone love burgers and pizza? When Adam Fleischman investigated, he discovered what they - and many other ultra-flavourful dishes have in common: umami. A renegade self-taught cook, Fleischman deployed this savory “fifth dimension of taste” to ratchet up flavour using ingredients naturally rich in umami, such as Parmesan, tomatoes, caramelised onions, and anchovy paste. In so doing, he created ultimate versions of icons, including Umami Burger with Port and Stilton, Sweet and Savory Brisket, and Parmesan Fondue. 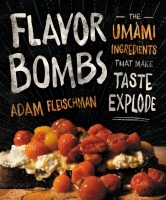 All the recipes are made from the same “umami pantry” ably explicated in the front of the book. The founder of the national empires Umami Burger and 800 Degrees Pizza shows how to detonate flavor in beloved dishes using ordinary ingredients high in umami.